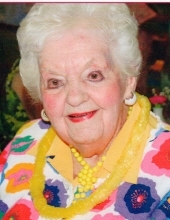 Mary Jordan Odor Morris, 100, widow of James C. Morris died on Feb. 1, 2019 in Lexington, KY. She was born in Williamstown, KY to the late Charles and Sarah Odor. She was a graduate of the University of Kentucky with a Bachelor’s Degree in Home Economics in 1938. Mary Jordan worked as the Home Demonstration Agent in Webster County from 1940-1958. She was a charter member of the Pakendall Club, member of the First Baptist Church, member of the Providence Garden Club and member and former… president of the Webster County Public Library. She resided at The Lafayette, Lexington, KY for the last 17 years where she celebrated her 100th birthday on Dec. 25, 2018. She is survived by her loving family and many friends. Graveside services will be held at 1pm on Saturday April 6th at Lakeview Cemetery with Kim Hudson officiating. www.joneskirby.com for more information and Online condolences.